Lisa He (left), an Engineering first-year who started fencing in the fall semester. Nicole Mee (right), a Civil Engineering senior, is a veteran fencer. The tall, scuffed, white walls of the racquetball court in Trees Hall echo the sounds of sophomore Gabby Simon’s immaculate footwork as she leads Pitt’s fencing club in drills. The fencers in front of Simon mimic her movement — squatting in a position reminiscent of a ballet plié — moving backward and forward at her call. When Simon raises a hand, they lunge, stabbing in synchronized jabs with imaginary weapons. Next month, Simon will help lead the Pittsburgh Fencing Association student club in preparation for two tournaments — the South Atlantic Conference in New Jersey March 19-20 and the College Fencing Championships in Rhode Island April 2-3. But the upcoming competitions haven’t distracted the club’s leadership from making every practice a learning experience, even for those who aren’t planning on competing. 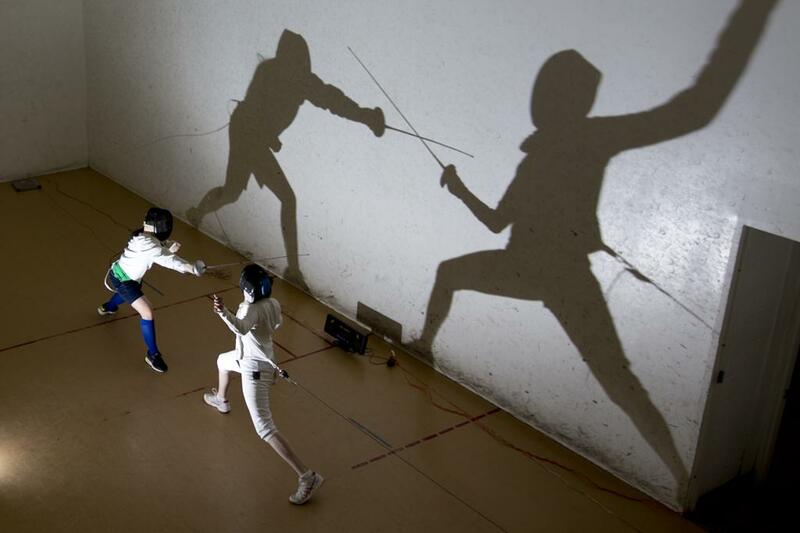 The 50 total members of Pitt’s Fencing Club meet three times a week, assembling in the racquetball courts at Trees Hall to learn from one another. Senior and club president Melissa Curioso alternates with Simon, a sophomore chemistry major, in leading the practice. “We don’t have certifications, we’re all students, but the people running the practices have had multiple years of training and we just apply what we know,” Curioso said. Fencers who instruct other club members, like Curioso, gained experience in unaffiliated clubs before college. Unlike Pitt, whose club focuses on education and improvement, other universities like the University of Pennsylvania — whose men’s fencing team has advanced to 16 Ivy League Championships — place greater emphasis on competition. Ivy League schools, where fencing is popular, take part in national championships that bring in elite teams from across the country, under the tutelage of professional fencers. At Pitt, with no outside help, more experienced fencers critique and teach the less experienced fencers as they go. Not having a coach does not deter people with no experience from joining the club, though, according to Curioso. “About half the people we have here today has had experience and the other half hasn’t, so we’re able to split up in pairs and teach each other,” Curioso said. Bout pairings are often made to challenge newcomers and to ensure they are using proper form. “Basics come first. You have to be meticulous and too nitpicky because bad habits build really quickly — especially in this sport. You’re really prone to accidents,” junior foilist Zihan Guo, who typically helps train new fencers on an individual basis, said. Simon, who fences épée, wears a brace on each ankle due to injuries she attributes to fencing with bad form in her past. When the club members don their elaborate white and sometimes electrified fencing gear, they separate by weapon to bout with people using the same weapon. Each member specializes in one of the three weapons: foil, épée or saber. The weapon a fencer wields determines where they are allowed to hit an opponent in a bout and what part of the blade the rules allow them to use. The athlete’s choice of weapon is entirely up to their discretion. Even though some teams at Pitt are lacking in members — like women’s foil and men’s saber — the club encourages new members to practice with the weapon they feel most comfortable with. There is no standard requisite for joining the Pittsburgh Fencing Association, as members join with various levels of experience. Some of the athletes, including first-year student Kalon Overholt, didn’t even consider fencing until arriving at Pitt. “I knew what fencing was before coming to college, obviously. I went to the activities fair and saw them doing a demo. I thought it looked really cool, and it’s awesome that it’s a viable option in college,” Overholt said. Sophomore épée fencer Jenna Cario also started fencing after attending the activities fair as a first-year student. She’s grateful that the chance to fence presented itself, noting it’s something she couldn’t have done prior to college. Jazmyne Easley (left), a junior Neuroscience major, started fencing as a sophomore. Thomas Zhang (right), a first-year Biological Science student, is a veteran fencer. She’s since taken the position of armorer, using her skills as an electrical engineering major to fix broken fencing equipment. “Being armorer is a really fun experience. I’m an electrical engineer, so fixing electrical equipment is right up my alley. It’s nice to use my expertise, if you can call that,” Cario said. Fencers said the benefits of learning from peers outweigh the negatives that could stem from a lack of formal leadership.